Where did SafeToteRx come from? The designer is a Lupus patient who takes 8-10 medications daily. He saw a need for organized medication storage when sitting in physician waiting areas. Does SafeToteRx offer a larger version? Yes, We now have a 12 bottle version of SafeTote RX. How many SafeToteRx’s can I order at a time? 24 is the standard order shipment maximum. However if larger shipments are needed call customer service for special arrangements. Can SafeToteRx store vitamin supplements and larger prescription bottles? Yes it can hold vitamin bottles and larger 90 day prescription bottles but not all bottles can be large. Is SafeToteRx theft and deterrent proof? 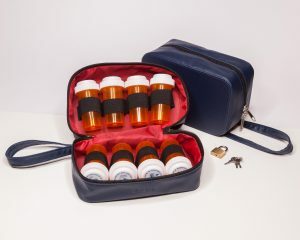 No medication storage container including SafeTote RX is deterrent proof from a determined individual. However in our opinion, the product is durable and does not draw attention because its design and color. 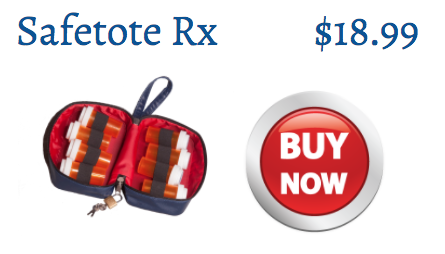 Why should I purchase SafeToteRx over an alternative product? 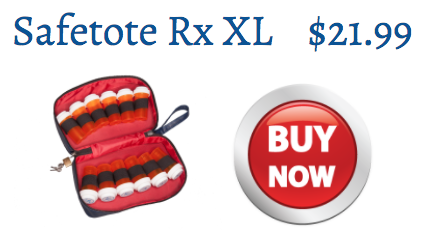 SafeTote RX is a discreet high quality medication storage locking bag. It is lightweight but effective in storing medicine bottles. It is compact and easy to store at home or carry while traveling. Many alternatives are bulky and not realistic for local and distant travel. 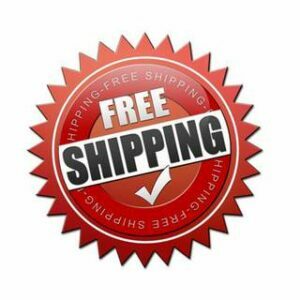 Does SafeToteRx offer special incentives or coupon codes for large orders? Coupon codes and special incentives are available for large quantity purchases. Email us or call for details.